The customer said ... Very efficient & professional throughout the fast process. You have saved us thousands of pounds if we would have had to program all the lost data. Mny thanks for your hard work! About the data copying - 5 SCSI disks were received for us to transfer data from an old Weeke CNC Routing machine (BP15 and BP12) circa 1994, 50 pin SCSI Seagate ST31200N HDD 1GB HDD . We made a backup disk image copy to allow clone drives to be made. The data was copied to 4 new SCSI hard disks (2x ST31200N (2072435 sectors = 1GB) and 2x Quantum ProDrive ELS (250068 sectors = 122mb). This made a clone to another SCSI drive as well as backup dd image file on a DVD and USB stick for furture use. If you need a Copy Data from CNC Router Machine SCSI HDD service, then contact our friendly company. The customer said ... Very efficient & professional throughout the fast process. You have saved us thousands of pounds if we would have had to program all the lost data. Mny thanks for your hard work! About the data copying - 5 SCSI disks were received for us to transfer data from an old Weeke CNC Routing machine (BP15 and BP12) circa 1994, 50 pin SCSI Seagate ST31200N HDD 1GB HDD . We made a backup disk image copy to allow clone drives to be made. 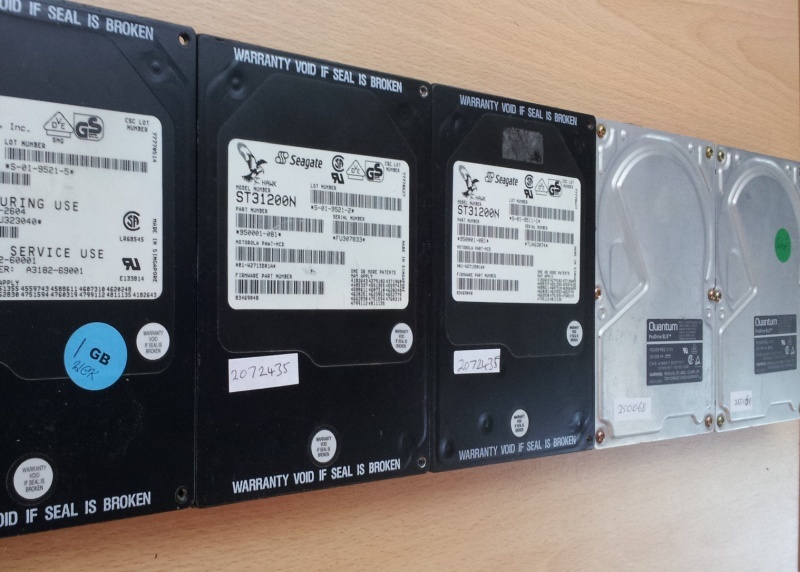 The data was copied to 4 new SCSI hard disks (2x ST31200N (2072435 sectors = 1GB) and 2x Quantum ProDrive ELS (250068 sectors = 122mb). This made a clone to another SCSI drive as well as backup dd image file on a DVD and USB stick for furture use..